This block is provided free of charge. Please don't expect too much in the way of support. As a designer or integrator who rolls out a concrete5 site, it's your job to make sure that the site looks good on delivery, is easy for the client to maintain, and stays looking good. Current content editing solutions are a bit cumbersome to use (5 extra clicks and 3 page loads on concrete5's content editing block), don't do true in-place editing, and, without configuraton, provide too much control to the editor like background color and font-face. You shouldn't have to manually fix the HTML code after every change made. 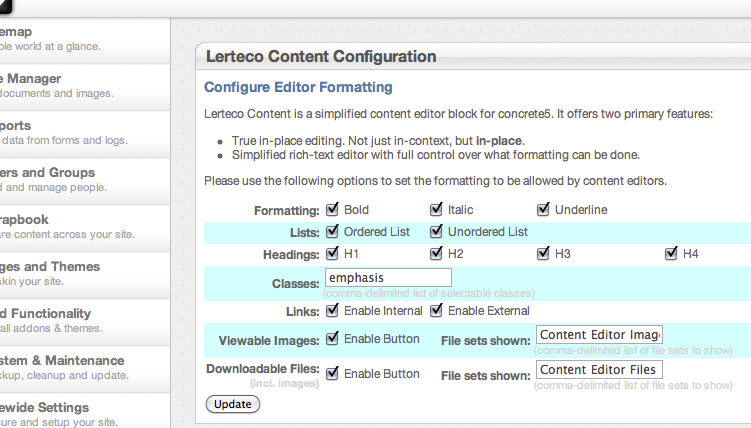 The editor is easy to load -- one click -- and allows editing in-place (not just "in-context"). 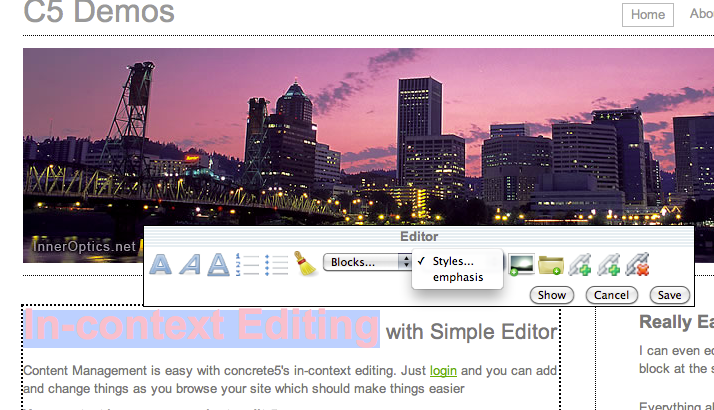 All site styles apply during editing, and seeing how the new text works with other text on the page is automatic. Is a title too wide for the width of the text box? Does too much text push another block below the fold? How will the content wrap around an element floated within the same div? When editing in-place, these answers are just part of normal editing. N.B. In order to make the editor as simple as possible and able to use all page styles, it uses an editable div rather than an iframe; a modern browser is required for editing. Plan on continued support for any of cross-platform the majors (Chrome, Safari, FF) released in the previous year. The demo available at http://c5demo.lerteco.com/index.php/login?uName=ceo requires login (username: ceo, password: ceoceo). After logging in, go back to the homepage and hover over one of the sections of content at the top of either column (or both).